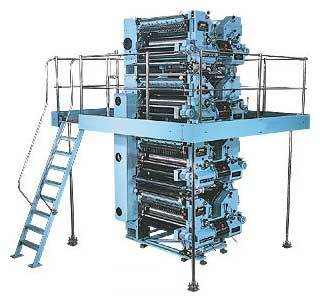 The 4 Hi can print maximum 4 x 4 colours on the both sides of one web or 2 x 2 Colours on both sides of two webs. Dynamically balanced hard chrome plated blanket and plate cylinders. Centralized lubrication for drive gears. On-the-run adjustment of plate cylinder circumferential register with calibrated movement of Â± 3 mm and side lay register with Â±5 mm. Full Platform with safety railing and stairways on 4-Hi arrangements. On the nose slit on spring type plate Lock-up system. Heavy-duty timer belt drive for 4 stack units.